Instead of searching individual databases, use Docket Alarm to search all of PACERat once. Docket Alarm searches all federal court cases simultaneously. By entering your query in the search bar and selecting “Federal Courts”, Docket Alarm’s search engine will search the entirety of PACER. Searching across all databases ensures that you have access to all relevant information, some of which might be buried in more obscure databases. Docket Alarm provides users with many different filters to quickly pare down results to only the most relevant information. 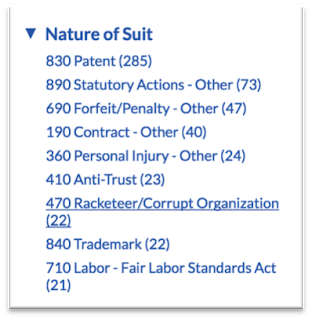 Filters like “Nature of Suit”, “Judge”, and “Party” limit search results to dockets that occupy a desired practice area, such as trademark, civil rights, or insurance; dockets heard by a certain judge, or dockets involving certain parties. Another way to enhance your docket research is to limit your inquiry to court opinions. Docket Alarm provides attorneys with a “Decisions and Orders” filter that returns a list of results comprised solely of final decisions and court orders, allowing you to quickly determine the outcome of cases and their relevance to your query. To conduct superior docket research, attorneys should also include searching expert testimony in their legal research strategy. Typing a query into Docket Alarm’s search engine results in a full-text search within individual PACER documents, enabling users to uncover an array of information about an expert, including litigation history, expert reports, credentials and more. Instead of researching in a vacuum, use Docket Alarm’s analytics to add context to your legal research. Attorneys have the ability to analyze their search results and view related statistics in real time, allowing them to see the impact a docket has individually and at a global level. These statistics can provide insight into many different facets of litigation, including the likelihood of certain outcomes, judicial leanings, and litigation trends, giving attorneys the power to devise informed, winning litigation strategies. Generic drugs come to market when the patents on name brand drugs expire. This results in branded drug companies losing their monopoly on the market for these drugs, forcing them to compete for the first time with their lower-cost counterparts. Branded drug manufacturers have figured out that it will cost them less money to pay a settlement to generic manufacturers to delay the release of these drugs rather than to have directly compete with lower-cost versions of their drugs. At the same time, generic manufacturers make money without manufacturing a product. It is a win-win for drug manufacturers, but not necessarily for consumers. This is not the first time this type of tactic has been used by branded drug manufacturers. In fact, it has been used so often that is has acquired a nickname, “pay-for-delay”, and stopping this practice has become a top priority for the FTC. This practice has evolved as a result of Hatch-Waxman litigation, known colloquially as Orange Book litigation. Oftentimes, generic manufacturers have to file lawsuits to compel branded drug companies to release expired patents on name brand drugs so they can bring generics to market. This type of litigation has become big business, with billions of dollars at stake. “Pay-for-delay” essentially bypasses this process, saving both branded and generic manufacturers time and money. To get the latest updates on this case and other Orange Book litigation, attorneys can sign up for Docket Alarm— the only legal research platform that offers attorneys a suite of tools to stay abreast of Orange Book litigation. Users can track updates to the Orange Book, search Orange Book correspondence, and view Patent Trial and Appeal Board analytics for Orange Book litigation. Download Docket Alarm’s free report on Orange Book litigation today at docketalarm.com/welcome/Big-Pharma-Patent-Litigation-Infographic.